This is the view seen while ascending to Helvellyn's summit. 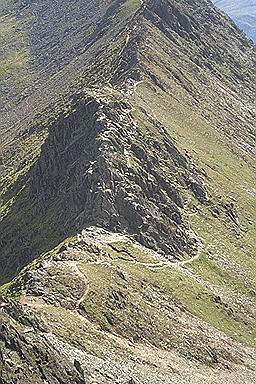 The easy path can be seen to the left of the ridge in the distance, and to the right skirting the final crest, in the foreground. In calm, non-icy conditions the writer recommends keeping close to the top of the ridge. An enlarged view of the final crest shows how best to negotiate the last pinnacle.